Willie and Cher, Johnny and Reba, Elvis and Whitney. To that list of notables who've performed at Memorial Coliseum, you'll be able to add one more. 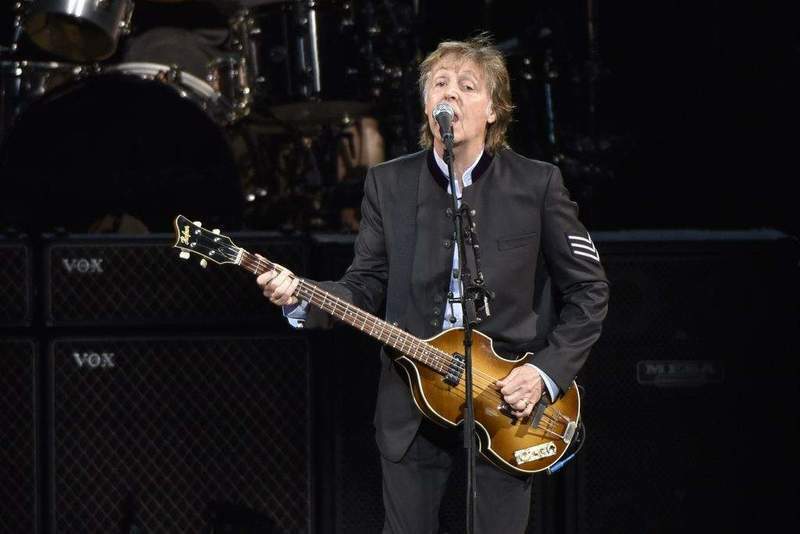 Former Beatle Sir Paul McCartney for the first time will put on a show at the Coliseum on June 3, officials at the Fort Wayne venue announced Monday. The show is part of McCartney's “Freshen Up”tour promoting a new album, said Randy Brown, the coliseum's vice president and general manager, at a dramatic news conference. The album, “Egypt Station,” was released Friday. The earliest tickets for the local show, for American Express cardholders only, go on sale at 10 a.m. today through Ticketmaster, reachable through the Paul McCartney page of the Coliseum's website, www.memorialcoliseum.com. Sales to the public begin 10 a.m. Monday through the Coliseum and Ticketmaster.com websites. Tickets then also can be obtained in person at the Coliseum box office at 4000 Parnell Ave., or by calling 800-745-3000. Before the announcement, members of the media were literally kept in the dark in the arena, lit by the Coliseum's giant new overhead scoreboard and blue overhead lights, for what was billed as a “historic” announcement. With small screens displaying photos of some of the name entertainers who've performed at the Coliseum, the McCartney announcement was made via video on the scoreboard. Brown said McCartney's long and winding road to Fort Wayne was aided by a relationship between the venue and AEG Live, a prominent music promotion company in Los Angeles, and “a longtime friend” of the Coliseum. “There was conflict in dates,” Brown told The Journal Gazette after the news conference. “They wanted to play new markets. We reminded them that Sir Paul has not ever played this market” – either as a Beatle, a member of Wings or as a solo act. Brown added Fort Wayne is “one of the smallest markets” on the tour. On Monday, two other additional dates were added to the six announced previously – New Orleans on May 23 and Phoenix on June 26. The tour also will go to Canada, Europe and Japan. McCartney gave a by-invitation concert at New York's Grand Central Station over the weekend. In Fort Wayne, he will be performing with members of his band for the last 15 years and a state-of-the-art video show, according to promoters. Nathan Dennison, the Coliseum's vice president of sales, said he expects tickets to sell out quickly. But, even with pre-sale opportunities, he said, some tickets will be reserved for public sale. Dennison said he didn't know if all price levels would be available in the public sale. Prices range from $29.50 plus fees to $295 plus fees. Both sales can be accessed through the Coliseum's website, Dennison said. At the news conference, Allen County Commissioner Nelson Peters read a proclamation declaring June 3, 2019, Sir Paul McCartney Day in Allen County. “What a great day for Fort Wayne and Allen County,” he said, reminding listeners McCartney has written or co-written 32 No. 1 songs and been enshrined within the Rock and Roll Hall of Fame in Cleveland. Peters added that although the venue has seen a lot of stars, “It's not every day you get someone major like Sir Paul McCartney coming to Memorial Coliseum.